Part of a Dorset industrial estate was cordoned off after a explosion was caused when an unattended bonfire spread to gas cylinders. Firefighters were called to a unit off Black Moor Road in Ebblake Industrial Estate in Verwood at 0515 GMT. 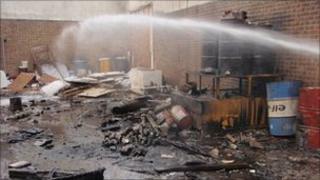 An acetylene cylinder exploded in the fire while three oxygen cylinders were cooled by fire crews. The service said bonfires should never be left unattended and said the incident wasted valuable resources. A spokeswoman added: "This could have been a lot worse had there been people living nearby. "The message is not to leave bonfires unattended, always extinguish them if you are going to leave them for any reason. "This would have prevented this incident happening and valuable resources being used." Police set up a 200m cordon around the scene which was later scaled back. No-one was injured. Fire investigation officer Mike Cox said: "It [acetylene cylinder] had exploded in the heat of the fire and we found the remains of it 80 metres away in the woods. "If that had been near to a domestic dwelling, someone could very easily have been injured or killed."